Makes you wonder doesn’t it? Everybody knows that engaged employees are much more productive and innovative. Even if you don’t quite believe the exact percentages often quoted, the concept is intuitive enough. Your employees are happy and so they go the extra mile to do a better job. You know you would. Why then would all managers and leaders in an organization not want to invest their time and energy in building a culture of actively engaging employees? Boggles the mind, does it not? The answer to that question lies in the innocuous bottle of hand-wash lying on your bathroom sink. Settle down comfortably. Get a cup of coffee. There is a long-ish story I need to tell you before getting back to the soap (and employee engagement). In spite of all the advances in medical science a visit to the dentist can still be a painful experience. It was infinitely so in the centuries gone by when medical science was in a very nascent state. The earliest attempts at anesthesia where mostly herbal (extracts of plants like opium used to induce drowsiness or a state of stupor). Alcohol was popular for a very long time, though the side effects were less than desirable. In the 1800’s there was a quantum leap in the options for anesthetics with advances in the field of chemistry. Morphine was isolated from opium in 1804. In 1830’s, building off experiments done by Sir Humphry Davy, wandering lecturers in the United States would hold public gatherings demonstrating the mind altering properties of diethyl ether (ether) or nitrous oxide (laughing gas). These gatherings were just sources of entertainment. A decade later, in 1842, William Edward Clarke administered ether to a certain Miss Hobbie while she was undergoing a dental extraction and in doing so became the first person to use an inhaled anesthetic in a surgical procedure. Clarke himself didn’t think much of what he had accomplished and it was his classmate William T.G. Morton who was the first to publicly demonstrate the use of diethyl ether as a general anesthetic at the Massachusetts General Hospital in 1846. News of the demonstration spread like wildfire. 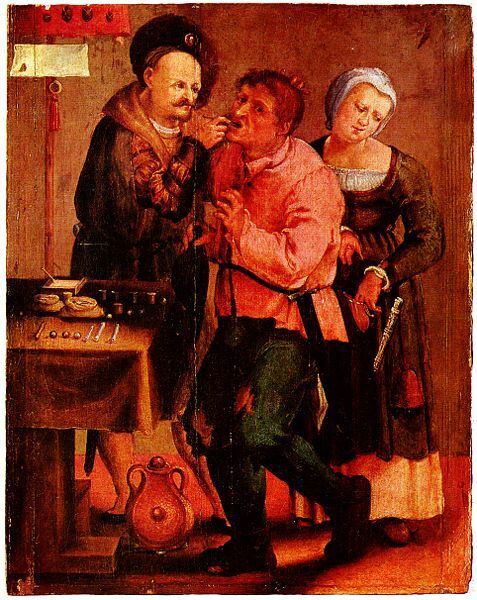 Dentists who had to deal with patients trashing and screaming in agony were quick to adapt and within months (not years) dentists across major cities in Europe and the US were administering ether to their patients. Delighted at not having to hold down their patients and work fast to minimize the pain, the concept was a hit with the dentists (and the patients). Around the same time, doctors were fighting another battle – Infections during surgery. In 1867 Joseph Lister first championed the used of Carbolic acid as an antiseptic. Until Lister’s studies into the causes of infection, most people believed that chemical damage from exposure to air was responsible for infections in wounds. A surgeon was not required to wash his hands and surgery was inherently practiced under unsanitary conditions – with unwashed surgical gowns having accumulated stains of past operations retained as badges of experience. But the adoption of antiseptic was nowhere close to that of anesthesia. Even decades later, washing hands and using antiseptics was an option for surgeons. Getting them to wash their hands was a major effort. They just wanted to start cutting into the next patient – just like kids just want to start eating right after playing in the dirt. The puzzle is why – If the benefits of using antiseptics were also obvious why wouldn’t everyone just jump up and do it? Surgeons in the 19th century or kids in the 21st? The answer: because it’s hard work and the results are not obvious right away. With anesthesia the results were immediate and the incentives were clear. No pain for the patient. More time for the doctor to work. Better results. No bitten fingers. And everybody is happy (more or less). A very visible problem was very visibly solved in the short term. With antiseptics, the problem itself was invisible. Nobody could see the germs dying. There were so many variables with a surgical procedure that it was difficult to pin point the source of failure. The effort that medical staff and surgeons would have to take was enormous. It was a paradigm shift and though the problem solved by antiseptics was much bigger, it wasn’t immediately obvious. So why am I telling you all this? And what do anesthesia and antiseptics have to do with employee engagement? Building a culture of employee engagement has the same challenges. It’s tempting for managers and leaders caught in the pressures of day to day business to fall back on the carrot and stick routine. “Do-this-or-else” and “If-you-do-this-then-I-will-reward-you-that” gets immediate results. Code gets written. Products get shipped. Timelines get met. But your teams are getting worn down. The code turns buggy if your tech genius is not sure why he is sitting in front of his computer at ten in the night. The products are defective if your production manager feels ignored at work. The timelines are met, but the shortcuts taken by design and quality teams along the way are not apparent – till the customers complain. The motivation is chipped away bit by bit. Yes your employees did something, but often they were clueless how they contributed to anything at all. Eventually they become demotivated and disengaged enough to move on or worse – they stay on and work against the organizational goals. The carrot-stick routine might get your employees to deliver in the short term. But the lack of an engagement culture will bring about the infection of disengagement in the long term. As a leader, the question you need to ask yourself is: are you playing for the year-end bonus or the category-leader award a decade down the line? This is so true and the story makes the reading worthwhile. (Though I did wonder at first where did kwench move on from employee engagement to medics engagement :)). In the era of fast foods and instant gratification, long term views or visions and plans get created and remains piled on the strategizing team’s workbench only to find its way into trash bins sooner or later. Maybe we need a breed of Engaged Leaders to ensure Engaged Employees!! I really like the title of this post Prashant and the question of short or long term playing.